The FSC HPD system detects any movement generated by a hidden person or persons in contact with the interior or cargo of a vehicle. Even signals such as a person’s heartbeat can be detected. Hidden person motion and human heartbeat are detected with the use of sensitive sensors attached to the vehicle either in a horizontal or vertical position. From the sensors, data is sent via cable to a computer, where the measured data is subjected to stringent analysis and subsequent evaluation. The measurement time is approximately 30 seconds while the total vehicle check time does not exceed two minutes, including application and removal of the sensors. Fare dodgers, illegal immigrants or terrorists may be transported in trucks from one country to another without meeting the legal requirements to enter these countries. Trucks are often sealed or loaded in such a way that renders standard visual check of the cargo space impossible. 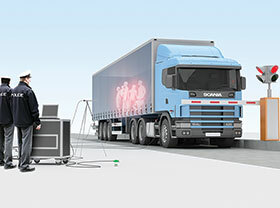 Not all methods, for example, the measurement of CO2 concentration or X-raying of cargo spaces of trucks are reliable in all cases and can sometimes be circumvented. HPD is a simple, non-invasive measurement method. It is passive detection that does not have any side effects for the human organism or equipment in its vicinity. It is the latest generation of a detector of hidden persons that makes it possible to reveal hidden people with almost 100% reliability in less than 1 minute. Three design versions are available and vehicles can be checked not only in permanent locations such as ports and border crossings and entrance gates of sites, but also in the field where checks may move.